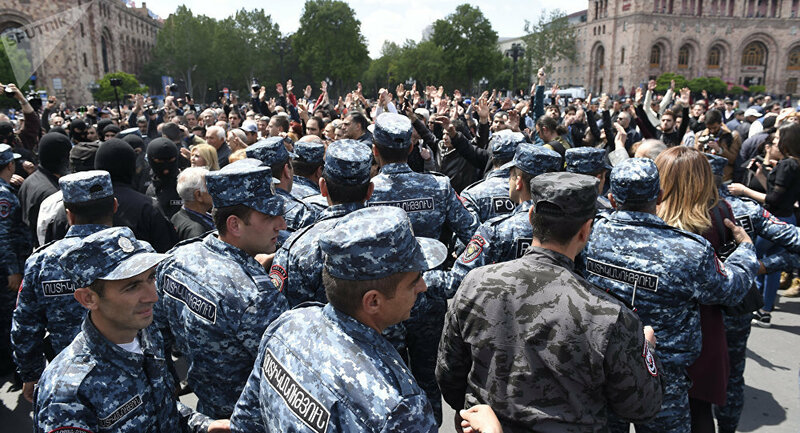 Police in Armenia detained three opposition leaders and almost 200 protesters today, drawing a rebuke from the European Union after demonstrators demanded newly appointed Prime Minister Serzh Sarksyan quit. Mass rallies began in Yerevan and other cities of Armenia on Monday protesting against the nomination of former president Serzh Sargsyan's candidacy for prime minister. But Brussels is anxious that today's meeting of the leader of the protesters Nikol Pashinian and Prime Minister Serzh Sargsyan has not helped to reduce tensions. The tense televised meeting in the capital Yerevan between the premier and Pashinyan lasted only a couple of minutes before the premier cut it short. "I came here to discuss your resignation", Pashinyan, the leader of the opposition Civil Contract party, had told the prime minister in front of the cameras. I can only advise you to return to a legal framework. "Various global organizations, the Armenian overseas diaspora, civil society, various political forces and the authorities have been calling to talks, for a discussion to avoid deterioration of the situation", Babloyan stressed. The protests, though peaceful so far, threaten to destabilise a key Russian ally in a volatile region riven by a long low-level conflict between Armenia and Azerbaijan and would, if successful, be a rare example of people power delivering reform in the former Soviet Union. Mr Sargsyan, before walking out of the meeting room in Yerevan's Marriott Hotel, said: "A party that scored 8 per cent in parliamentary elections can't speak on behalf of the people". Dozens of protesters were detained, a journalist reported from the scene. The police called on protesters to stop the situation from escalating, the Interfax news agency said, quoting an official statement. Sargsyan was about to complete his second and final term before Armenia's semi-presidential government was changed to a parliamentary system, giving greater powers to the position of the prime minister, which does not face term limits. "If these demands are not fulfilled, the police has the right to take demonstrators into custody and to use force", Interfax cited the statement as saying. The EU urged parties to the political conflict in Armenia to show restraint.